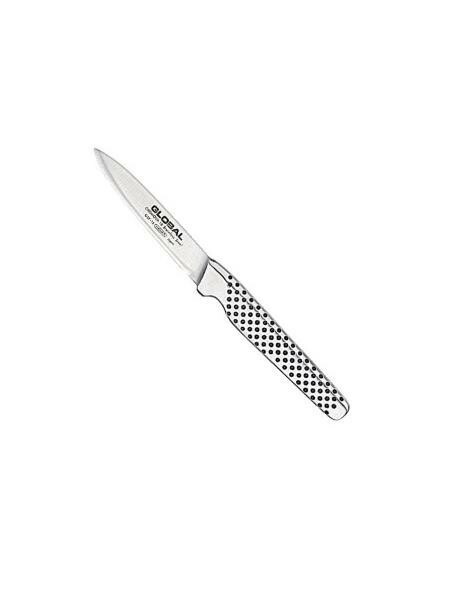 The Global Paring Knife - GSF15 is from the Global GS Series, the supplementary series to the Global G Series, the basic range of kitchen knives for sharp, light and clean use. The Global GSF Series is designed for the most detailed and delicate tasks in the kitchen. The blade of the Global Paring Knife - GSF15 is made from CROMOVA 18 stainless steel, ice tempered and hardened to Rockwell C56-58. The result is a blade with superb edge retention and resistance to stains, rust and corrosion. Each Global Paring Knife - GSF15 is also weighted for perfect balance in the hand. The handles of the Global Paring Knife - GSF15 are designed for exceptional safety and hygiene with smooth contours and seamless construction, eliminating food and dirt traps. Global is known around the world for its top-class kitchen knives. Established in 1985 in Japan, Global forged a world first in one-piece stainless steel kitchen knives. Global Knives are now made from the finest stainless steel and crafted by hand in Niigata, Japan. Today, Global Knives are favoured by high ranking chefs in the world's most exclusive hotels and restaurants. Global Knives also feature regularly on television, in the hands of many famous cooking personalities. From a modest start, the Global Cutlery Range has grown to comprise over fifty specialised knives. You can be sure that there's a blade shape to suit any food preparation task that you care to imagine.